Michelle and Jonathan visited Puerto Rico for official wedding planning purposes. 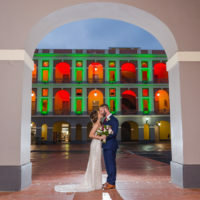 During that time, besides meeting with vendors and choosing venues, they used the perfect spring weather for having their engagement portraits done in beautiful Old San Juan. There are no two identical engagement sessions, and in M&J’s case, that uniqueness came in the form of a little person: their kid. I loved having him incorporated into their engagement session. Not only because kids make everything happy, spontaneous and cuter… But also because he’s interested in photography, and he even brought his camera along. As I positioned them for poses in the colorful streets, I heard the shutter of his camera going off. It was a heartwarming experience, and a happy afternoon together. When I thought the day couldn’t get any better, we were surprised by a beautiful sunset as a perfect backdrop for our final part at El Morro. Everything was perfect! I enjoyed capturing this moment between Michelle and Jonathan, and I hope you do too.